U.S. History teachers and students at East High School carved an intriguing niche into the course curriculum this year. They’re going to examine their school’s own long story within the broader context of America’s. In particular, students will consider how to change what they consider to be a widespread misperception of East High. No school in the district makes a better laboratory for a deep dive into local history than East. The East Des Moines Public Schools, a forerunner of DMPS, launched their high school in 1866 and the Scarlets have been at home on the campus at E. 13th & Walker for over a century. The lobby at the main entrance of the original building is paneled with historic plaques commemorating the service of eastside soldiers in America’s great wars, and that’s just a hint of what’s in store inside. Throughout this yearlong project, eastside VIPs will be invited to come and speak with students. Tuesday morning State Representative Ruth Ann Gaines was the first. 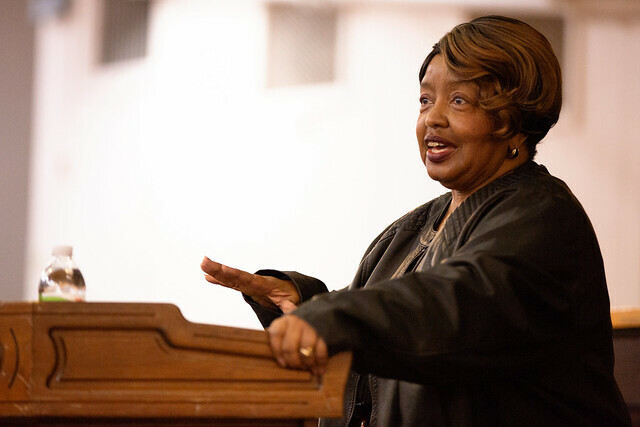 Before her election to the state legislature in 2011, Rep. Gaines taught drama at East for 40 years. She grew up in parochial schools, and said there was a stigma about East being a school of hard knocks when she began her career there. Eastside Pride probably warrants upper case treatment, maybe even inclusion on the periodic table of elements. It’s a powerful force that finds expression in the school’s alumni association, one that boasts of being among the nation’s largest and oldest, dating all the way back to 1877. Last year the group raised more than $160,000 for scholarship awards to the Class of ’18, an all-time high. How’s that for making some school history? Sounds more like big bucks than hard knocks. As the project unfolds, one aspect that will bear watching from the outside is the volume and pattern of response to the community survey that’s just underway. It’s unscientific, but still promises to be revealing, and maybe surprising. We’ll check back for updates on the results. To participate in East High’s survey, click here.